1. Hummingbirds are migratory and will start their journeys north very soon. In our region, we usually see the first hummers towards the middle of March. To make our location more attractive as a potential permanent home, it’s time to ramp up our feeding stations. No one likes wet and diluted food or to get soaked while dining, neither do the Hummers. 2. There are 15 types of hummingbirds in North America. Their favorite food is nectar, be it from the flowers in your garden or from a special feeder. Cleanliness is very important, select a feeder size that is either emptied every 3 to 4 days or empty and replace the sugar solution yourself to keep the nectar fresh. 3. Most urban gardens are not naturally rich in nesting material supplies. No longer do chickens run wild and leave behind assortments of feathers, nor are there fluffs of cotton or animal hair stuck to bushes and trees. Encourage the travelers to stay in your garden by providing some natural replacements for hard to find nesting materials. Your efforts can be as simple as tucking your pets brushings into the bushes here and there. Please skip the food coloring! Some research suggests this addition is not a healthy choice for birds. Choose feeders with prominent colors or hang out some of last years Christmas bows near your nectar feeders instead. Combine 1 part white sugar to 4 parts water. Bring to slow boil for 2 minutes. Cool before pouring into feeder. Excess may be stored in the refrigerator. Hummingbirds favorite plant in our garden: Penstemon! My garden expands and changes each season, as most people’s probably do. It began as a small flower bed at the end of the sidewalk. It was about three feet in diameter. The next year, I extended it down the sidewalk, changed its shape, and added a border. Then, the third year, I decided to triple the area the garden occupied, and the year after that, we added a small pond and expanded the planting area yet again. This year, rather than digging up more grass, we began adding structures. I had a hummingbird feeder sitting on a shelf in the house (where no bird would ever find it!) and bought a bird feeder on clearance last winter, so one of the structures had to be something to hang two feeders from. Using old tent poles, I made a structure for a vine to climb and the bird feeders to hang. The first feeder, freshly filled. 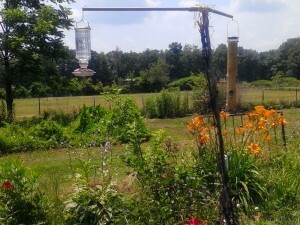 The structure went up in March, and I filled one feeder with seed, and watched for birds. 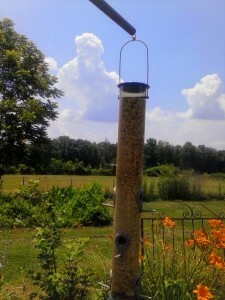 A week later, the feeder was still completely full. Two weeks later, no seeds were gone. The third week, I said, “LOOK! Some seeds are gone!” My dad admitted to shaking some out for the chickens. Then, one day, I saw a cardinal at the bird feeder. Within a week, two inches of bird food were gone. On the day I filled the bird feeder with seeds for the second time, I also filled the hummingbird feeder. It took a little while for the hummingbirds to find it, but I see them occasionally. There are more birds in my yard now than there have been in the eight years we have lived here. I’ve seen bluebirds, mockingbirds, robins, hummingbirds, LOTS of cardinals, and a few days ago, two tiny, bright, gorgeous gold finches. The bird feeder empties regularly, and birds sit on top of my grape arbor most of the time. I suspect they bathe in the pond but haven’t spotted them at it yet! Birdsong is cheerful. The birds themselves are beautiful. Having them in the garden makes me happy. If you don’t have as many birds as you’d like, try putting out a feeder. Then, wait patiently!